Mechanical Squirrel sez: "Transmog that unsightly non-matching raid gear! 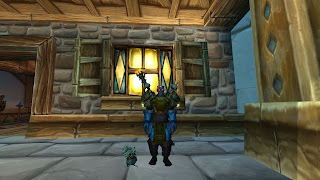 With 4.3 creeping ever closer (the background downloader makes it feel like it's coming RIGHT NOW,) I'm feeling a little bit more compelled to have something to transmog. 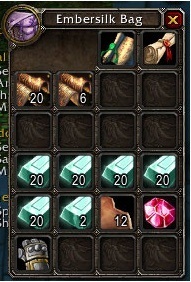 My guild isn't really into farming old content for vanity loot, so I found a simple solution that I think is still fun enough to wear around. 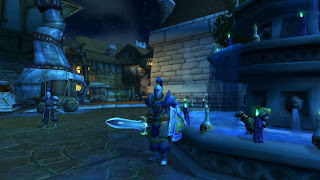 With Jacklalane being a human paladin, I'm given the not-so-unique opportunity to make him look JUST like a guard in Stormwind. The Imperial Plate armor set is amazingly easy to get, and aside from the shoulders it looks identical to what Stormwind guards pat around in. I decided to forego the bracers, since you cant see them anyway. Since the set lacks gloves entirely, I grabbed some Platemail Gloves from a vendor. They're a temporary solution since I don't believe you can transmog stat-less items. I added a Grand Marshal's Longsword and Aegis to finish the look (purchased for a mere 370 honor.) As you can see in this convenient comparison with an actual guard, the Imperial plate shoulders don't exactly match, nor do the gloves. Wowhead commenters suggest using Heavy Mithril Shoulders as an "acceptable" substitute, but I think they're too purplish. As it is, I think the set looks fantastic, especially considering the minimal effort involved. More transmogging will certainly happen. I've got a pretty delicious looking set of brutal gladiator pvp gear that will probably see some use, but I think I'll definitely spend some time raiding in this getup.